Las Catalinas development and resort at Playa Danta is an incredible place to stay for the adventure seeking family. 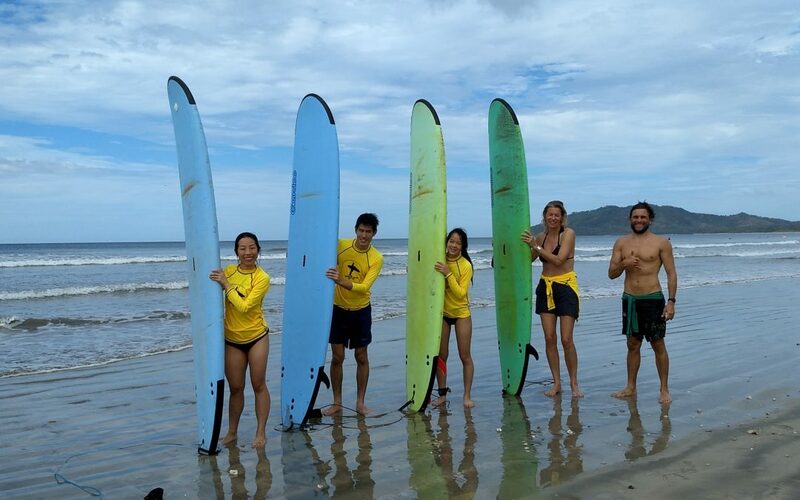 While the beach right out front of Las Catalinas community is better suited to SUP and kayak, swimming and snorkeling than it is to surfing, a mere 35 minutes away sits Playa Grande, one of the best beaches around for guests of Las Catalinas to take surf lessons. 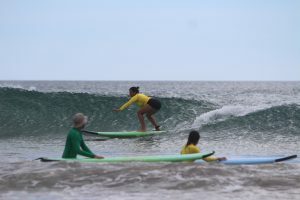 Why Playa Grande for surf lessons if you are staying at Las Catalinas? 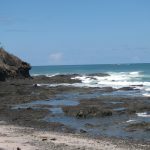 Playa Grande is the closest beach suitable for both experienced AND beginner surfing. This may seem odd at first, however, the name itself explains: ‘big beach’- the beach at Playa Grande is so long, that it stretches almost all the way south to Tamarindo, but without the crowds! One end of the beach boasts one of the most fun waves for intermediate and experienced surfers, while the protected, south end of the beach is perfect for beginner surf lessons. How does it work? 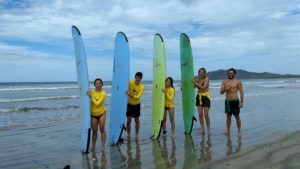 What are my options for surf lessons if I am staying at Las Catalinas? 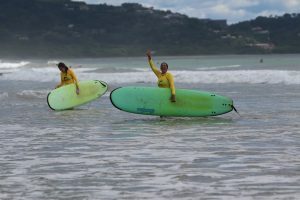 Private surf lessons are highly recommended, for the simple fact that they are more personalized. You know your family and friends, and how everyone behaves in certain situations. When you invite strangers into the mix, you never know if one will be super scared, needing intensive instruction from the surf coach, leaving the rest of you with less attention than you would like. For highest safety measures, we allocate one instructor per 4 people over 12 years old. 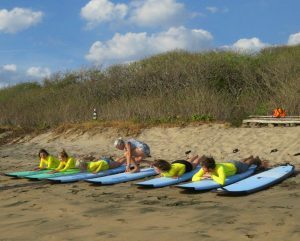 Families with little ones under 12 might choose to add an extra surf instructor, or simply take turns so that safety remains paramount. All our instructors receive regular updates to first aid, CPR training, and can be counted upon in an emergency. You have several options to get to Playa Grande from Las Catalinas. 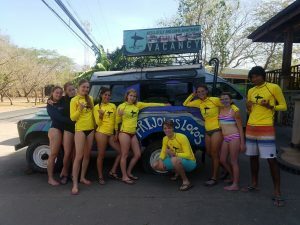 As a guest of Las Catalinas, you can book a surf lesson with Frijoles Locos Surf School online and add the option for transportation, and it will all be taken care of for you. Round trip cost is $80USD. 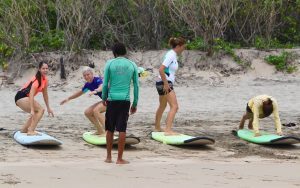 The concierge at Las Catalinas can also book your surf lessons for you. They have a great team, including Mhairi, Fabio, Maria Jose and Estefania, among others! You may choose to save some money and drive yourselves, if you already have a rental car. Don’t worry, we provide detailed, super clear driving directions so you won’t get lost! What if we don’t all want to surf? Easy! Frijoles Locos can provide rental of shade tents, a cooler with ice, beach chairs, boogie boards and even stock you up with some of Playa Grande’s own micro-brew beer! Chill out on the white sandy beach while the rest of your crew surf, and take in the surroundings. 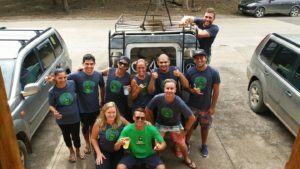 After the surf lesson, we can guide you to one of our favorite restaurants in Playa Grande- there are so many good options on places to eat and drink in Playa Grande, you will be pleasantly surprised! If you choose to have us arrange transport, you might like to take the water taxi over to Tamarindo, and be picked up by your private transport van from Tamarindo after doing a little exploring there. Many options for a super fun day abound. Email us, or book now! Ready to book? Click here and you won’t be disappointed! Shakas and surf. Playa Grande near Tamarindo. No doubt about it, learning to surf is hard! Here are 4 tips for beginner surfers, to ensure you stand up on a wave the first time you surf. 1/ Determine if you are goofy or regular foot. Goofy foot surfers have their right foot forward and regular foot surfers have their left foot forward. If you snowboard or skateboard, you should already know which of these you are. If not, have a friend push you from behind and whichever foot you step forward with first, becomes your front foot. 2/ Practice pop-ups on the beach. Draw a cross in the sand and lay down on it so your chest rests on the center of the cross. With hands in a wide push-up position, at chest level, draw your tummy in, to create space for your front leg to come through and plant your front foot at the center of the cross. Your back foot remains behind. Both your feet should be perpendicular to the vertical center line, not parallel as if you were skiing. Repeat, as many times as needed, until you nail the pop-up. 3/ Keep your hands flat. Think stable table. Hands flat on the surfboard will keep the surfboard steady. A common beginner surfer mistake is to grab the edges of the surfboard like reading a book- it will rock and roll and you will fall off. Stay in the area of the beach where the waves have already broken. This area is referred to as the white-water. Allow the white-water waves to push you toward the beach, and stand up as soon as you feel the power and speed of the wave. Always cover your head with your arms before coming up for air after you fall off the board. This will help you avoid hitting your head on your board or fins. Surf only where you would be also confident swimming. Final words of advice: Invest in a surf lesson from a professional surf instructor. 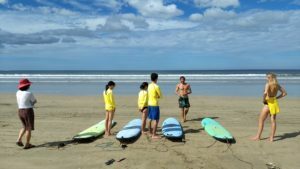 A good surf instructor will help you choose the right location, learn safety tips, improve faster, identify your mistakes, and make the whole experience more fun and rewarding. We look forward to taking you surfing. Many travelers find great joy in giving back to the communities they visit. Creating meaningful travel is easy when you visit Playa Grande and surrounds on your next trip to Costa Rica! How can I participate in a meaningful way? Frijoles Locos Surf Shop is proud to support La Paz Community School. Their scholarship program gives today’s youth all possible chances for a bright future. In generations to come, local families will have more opportunity to create their own businesses and become leaders within the community. At the same time, an increased awareness of our environment and importance of sustainability is encouraged. La Paz Community School is a non-profit organization that was founded in 2007 in order to address fundamental socioeconomic and cultural gaps prevalent in this region. Providing a meaningful, thoroughly outside the box education to underpriveleged youth paves the way to change. The difference this school makes to the community at an individual, community, and nationwide level is palpable. Fill empty space in your luggage! The scholarship program at La Paz Community School enables students who would never have been afforded the chance to receive such a quality education, to do so. While donations to the scholarship fund help cover costs of education, there are so many other needs to be met, which is where you can really help (Pack for a Purpose). Pack for a Purpose encourages travelers to fill space and empty pounds in their luggage with much needed supplies such as crayons, pens, pencils, rulers, compasses, frisbees, musical instruments and more. 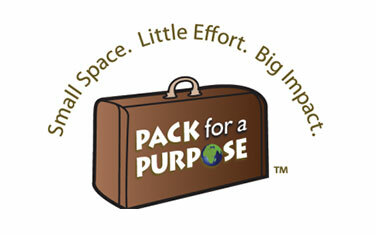 Check on the Pack for a Purpose site to see what is in most demand at the time of travel. Meaningful travel starts with action from you! Frijoles Locos supports CEPIA, founded by the wonderful, talented and visionary Laeticia DeWeer. CEPIA is an organization that helps improve the quality of life of youth and families in the local area, by supporting and training to assist the poor in job placement, teaching new skills, attending to physical and mental health of those in need, and promoting cultural development. Your time and effort is appreciated- contact CEPIA to find out ways to can help. Thank you for your time and effort in giving back to the community you are visiting. In this way, you are truly helping to change the future of these wonderful children and consequently, their own families. Although our 6 year old charges these waves, doesn’t mean they are just for beginners! Something for everyone in Playa Grande. 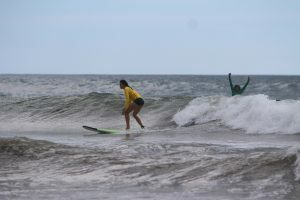 Surfing Costa Rica- Playa Grande’s best spots and nearby surf breaks…To surf Playa Grande, Costa Rica you will need to access the beach at one of a few options. The main public beach access is at the end of the road straight down from Frijoles Locos Surf Shop, where Hotel Las Tortugas is, and 200 meters north of here known as ‘the palm trees’. Palm trees are great for families, offering good shade. Both places have guarded parking for $2 per vehicle. Don’t leave anything in the car anywhere, ever! Palm Trees surf spot is closest to Casa Costa Palmera, Casa Sylmar, Casa Blanca, Villa Siempre, Villa Olivia and Casa Mirage. Nearby the rock there is a wedgy beach break but not good for beginners. Beginner surfers should stick to Palm Trees or between Casa Mirage and around 100m north of Hotel Las Tortugas. There is parking in front of RipJack Inn also, but not guarded. No matter what, never leave anything in your car. Ever. Head high to a 6 ft surfer. Double overhead to a 6 year old. It takes a good 25-30 minutes to walk to or from the Tamarindo estuary to the main peak in front of Hotel Las Tortugas. Main peak has plenty of crowd, plenty of vibe, and should only be surfed by competent strong intermediates and up. Palm Beach Estates to the south end of Playa Grande has a long stretch of beach with breaks all along. Sandy bottom… tends to have more walled up waves but can be fun on the right day. Casitas is at the very south of the beach before the river-mouth. Other nearby breaks include Playa Avellanas (all levels of surfer), Playa Frijolar (Marbella), Junquillal and Playa Negra (truly advanced surfers only). Check out our Driving Directions blog to access information on how to get to some of those other surf breaks mentioned. Rent your surfboards from Frijoles Locos and ensure that you have something great to ride, that the airlines haven’t damaged en-route or charged you a fortune to carry! The Frijoles Locos Guide to Playa Grande Attractions and Activities. 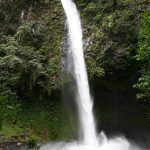 Here is a summarized outline of things to do in Playa Grande, Costa Rica during your vacation. For more in-depth information, check out our ‘tours and information‘ tab on our homepage. Playa Grande is famous for its Leatherback Turtle nesting season (October to March). You can arrange a night-time turtle watching tour at the local MINAE office. 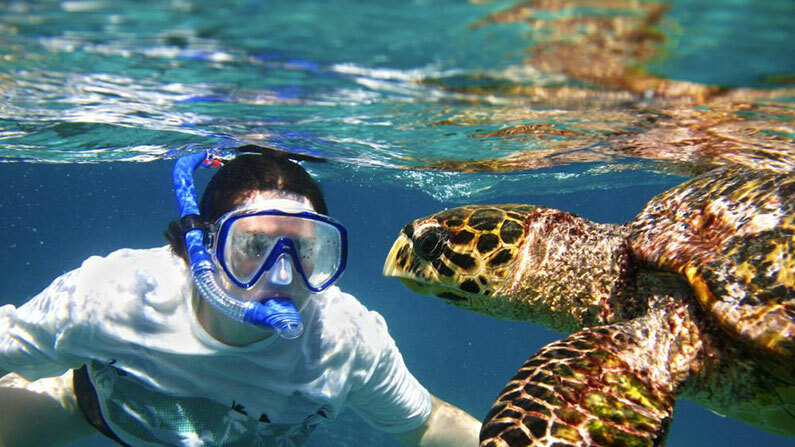 Guided tours cost $26 per person, and if you don’t see a turtle, you can come back for free the next night. Rent a bicycle and explore the area. 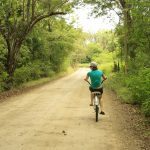 Low-tide biking on beach cruisers is a great way to get to Tamarindo to explore. Bicycle rentals are available from Frijoles Locos Surf Shop. Early morning walks to look for monkeys- they are loud! Just follow the strange, deep bellowing sound and take your camera. El Frijol Feliz Day Spa located at Frijoles Locos offers massages, facials, pedicures, manicures, body scrubs and more. Day-trips to Arenal Volcano, Rincon de la Vieja National Park, Palo Verde National Park and more are easily arranged through your hotel or at the local tourist information. Yoga Classes are conducted 6 mornings per week in the high season at the RipJack Inn. Surf lessons for all levels are available from Frijoles Locos Surf Shop. Take a Spanish class- ask at Frijoles Locos for more info. Kids love the tide-pools at low tide… bring with you a little kid’s fishing net that doubles as a butterfly net when you aren’t at the beach. Walk to Playa Carbon- the black sand beach to snorkel or just feel a million miles away from it all. Pack a picnic lunch and enjoy! For night-clubs and night-life, Playa Grande isn’t the pick. Tamarindo is where you go to party, any night of the week. Wednesday nights in Potrero at Las Brisas are Ladies’ Night, a hot pick for some all night music and dancing. Welcome to Frijoles Locos Surf Shop! 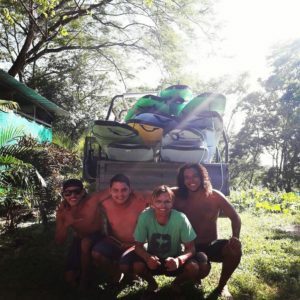 Check out all of our amazing tours, vacation packages, surf lessons, rental gear, and accommodations for the most epic Costa Rican vacation!